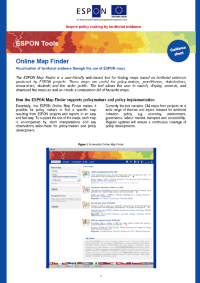 ESPON has developed a brand new web application to search, display, zoom-in and out, download maps as well as create a comparison list of favourite maps. The web application has a user-friendly interface which allows you to find a specific map resulting from ESPON projects and reports in an easy and fast way. The maps are accompanied by an explanation and key observations for policy makers.